Not too long ago we discussed how to find the perfect foundation shade, but what about the ideal formula? From powder to mineral to liquid, the options can be overwhelming, to say the least! Today we’ll be focusing on differentiating among the available types and pinpoint which one works best for you and your skin type! Powder – The lightest of coverage, this type of foundation is sheer and a great option for those with blemish-free skin who do not need a lot of coverage, or for those trying to counteract oily skin. Mineral – Gives a medium, buildable coverage. A good choice for any skin type. Mousse* – Also referred to as “whipped,” this is a newer formula on the market that is known for its light-weight application and provides medium to full coverage. Cream* – This particular formula tends to have a thicker consistency and gives full coverage. Good choice for those with dryer skin and a great option for winter months! Liquid* – Provides medium to full coverage. A good choice for any skin type. * If your skin is oily, opt for an oil-free version. Pro tip: When possible, purchase foundations that have SPF in them (in addition to what's in your moisturizer) for extra sun protection to preserve your youthful-looking skin! 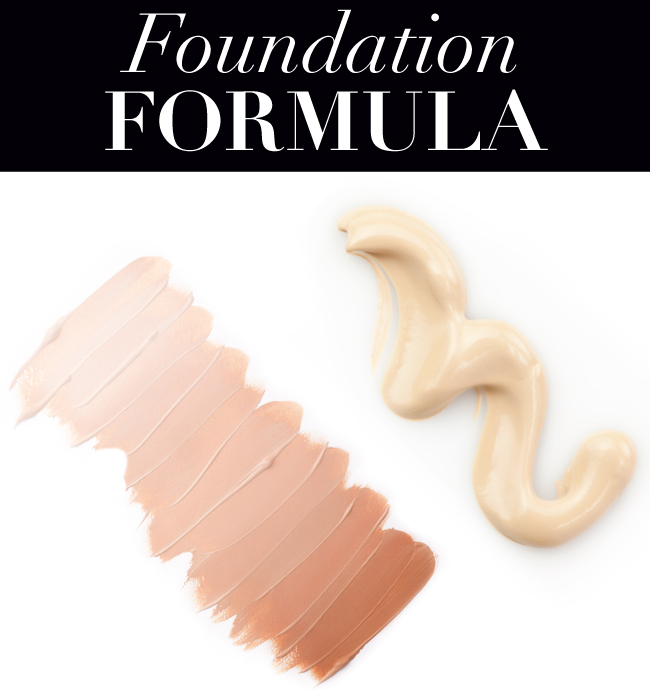 Which foundation formula is your favorite? I usually use a particular mousse which is in a stick package and, instead of a simple powder, I set it with a mineral foundation. So... bye bye redness!!! Sounds like a great combo! We're glad to hear you found a formula that works for your skin type! I use liquid and Mineral. Thanks for sharing, good to know! How is powder, even mineral powder, a good choice for aging skin? Doesn't any powder just settle into lines? Stopped using pressed or loose foundation powders long ago. Good point, Marilyn - thanks for bringing it up! YOU ARE ABSOLUTELY RIGHT! ALWAYS USE LIQUID OR CREAM WITH DRY OR WRINKLED SKIN.... POWDERS WILL AGE YOU AS THEY INTENSIFY THE LOOK OF WRINKLES AND MAKE YOU LOOK EVEN OLDER AT TIMES! MOIST PRODUCTS LEAVE YOU WITH MOIST DEWEY LOOKING YOUNGER SKIN. Yes, the F82 is an all-around great foundation brush! I use Liquid and Mineral foundation's. Thanks for posting this, it's good to know what brushes you recommend! Your skin changes as you age so it's always good to test out new options to make sure you are using what's best for you!